This article applies to PT.Transact+ only. There's a lot more to PT.Transact+'s invoices than you may realise. We've previously published a short tutorial on how you can personalise and beef up your invoices, which you can read here. In this tutorial, we're going to show you how you can further personalise your invoices by adding buttons to them. Buttons are a great way to add a link or action to an invoice whilst making it stand out to your clients so that they can click on it. For example, you may want to have a button asking your client's to Like your Facebook page. In our previous example, we did just this using plain ol' text. But wouldn't it be great if you have a nice big button on your invoice that really stands out? That makes the call-to-action (CTA) much more effective. This guide will show you how you can do this. Of course, you can use the same technique to add multiple buttons that do different things. It's completely up to you. Where Can Buttons Be Placed? 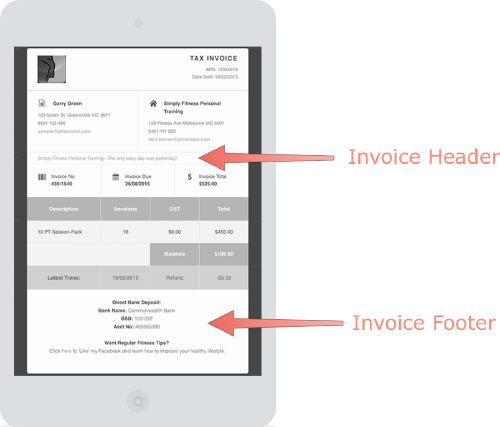 What Does an Invoice Button Look Like? In PT.Transact+, tap the Menu button at the top-left of the screen, then select Settings. 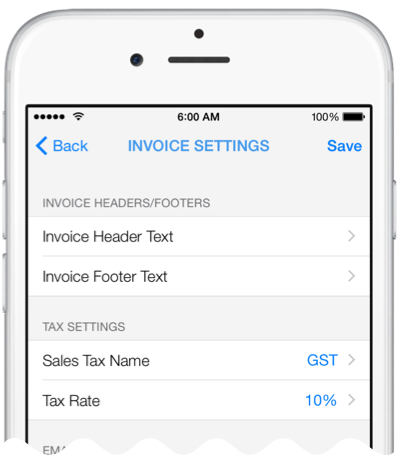 In Settings, tap Invoice Settings, then either Invoice Header Text or Invoice Footer Text. As you might expect, anything you enter in Invoice Header Text appears at the top of invoices, and anything you enter in Invoice Footer Text appears at the bottom. 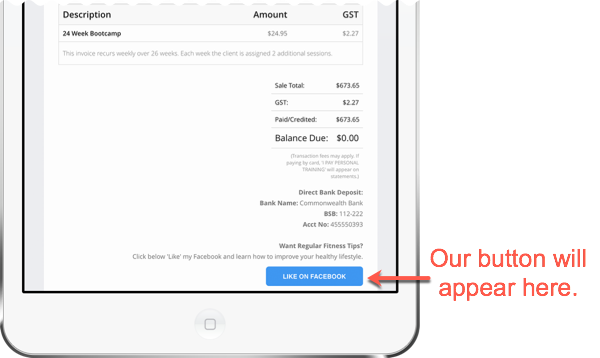 For our example, we're adding a button to our invoice footer, so tap Invoice Footer Text. When adding a button to an invoice, you can define its background colour, the text that appears on it, how wide it should be, and finally what web site your client should be taken to when they click it. Of the four properties, only text is mandatory. You can omit the colour and width, and let PT.Transact automatically calculate how wide the button should be and what the colour should be (which will always be the "PT.Transact Blue" colour). The fourth property-- the web site-- is also optional, but you should include it because if you don't, the button will do nothing when it is clicked. In this example, we've supplied both the text and the web site URL. These two properties are entered inside a pair of quotation marks (""), and are separated by a semi-colon (;). The order that properties are entered is very important. Button text (any text you want). Web site URL (must be a valid web site address, starting with either http://, https:// or www.). Button width (a whole number, such as 250). Button background colour (a valid HTML-compliant colour code, such as #8a2be2). For our small example above, you can see we've entered properties #1 & #2 (text and URL). We skipped #3 & #4, as we're happy with PT.Transact using the defaults. This leads to a particular problem. What if you want to supply a custom colour to the button but not the width? In this case, just enter 0 as the width, which is tantamount to asking PT.Transact to calculate an appropriate width for you. Now let's add our Facebook button. Text: "LIKE ON FACEBOOK". For added emphasis, we've put it all in caps (shouting!). 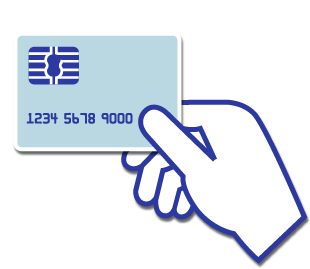 Web site: "http://facebook.com/pttransact". This is PT.Transact's Facebook page. This is the site that will come up when the button is clicked. Width: "200". This means "200 pixels" wide. It's sometimes hard to judge how wide the button should be, so it's usually easier to enter "0". Colour: "#3E96F0". This is the HTML code for PT.Transact Blue. Note the "#" in the code. All HTML colour codes use this. Be careful when entering in widths or button texts that are too large. 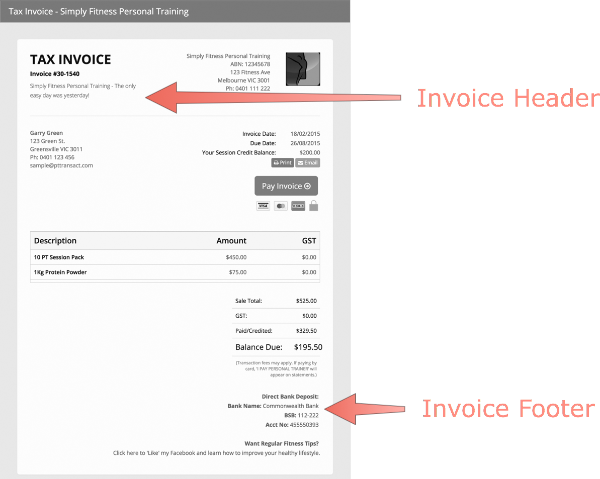 A width may look fine when viewed on an online invoice but may appear distorted on emailed invoices. We generally recommend keeping the text short and succinct, and letting PT.Transact calculate the width. You can enter a maximum width of 500. If you enter a value greater than that, PT.Transact will use 500. Visit http://htmlcolorcodes.com/ for a great tool for finding HTML colour codes. If you have any questions or experience any difficulties with button tags for your invoices, please don't hesitate to contact PT.Transact's awesome Technical Support team at support@pttransact.com, and they'd be happy to help.